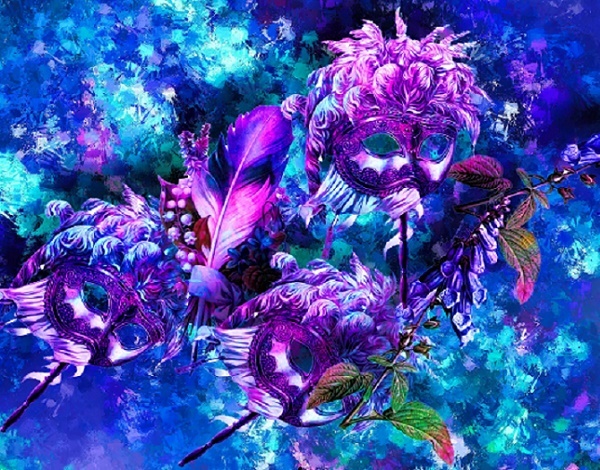 No matter how beautiful and colorful, a mask is still something you hide behind. Wouldn’t it be grand and wonderful if we felt secure enough to reveal all the parts of ourselves to other people? Our deepest concerns and worries. Our greatest hopes and desires, so that we might be supported, encouraged and empowered to become all that we can be. But too many of us never do. Fear of being hurt or even worse – spurned, rejected and ignored – keeps us within carefully constructed facades. Our “acceptable” masks. The ones we feel safe in wearing. The masks we spend a whole life improving upon. Proportionately speaking, the probability is, the more well crafted our “masks of life” become, the less capable we are of fulfilling our own personal hopes and dreams. Within the safety of our masks, (and some of our masks are so well conceived they become works of art we present to others – impenetrable and yet transparent), we become seemingly predictable, agreeable; illusions of what others think we should be. Very acceptable and very stagnant – An entropy of life. Not who we had meant to be at all … in the beginning of things … when we first started out! Take off your mask of acceptability! You – the person beneath the mask – are really quite amazing. No more hiding. ← Regrowth and Renewal – Yes you can! I do agree with Alastair, for those who design their masks very early in life, it has become their reality. It takes special people we encounter in life to help us shed these masks, to see the real person who lies beneath. Very well written Penny. Time to live indeed Penny! Let’s go for it! I wear a mask twice a week or so. But – it’s just for about 10-15 min each day. According to the instructions – I’m supposed to look like a Hollywood star afterwards. I think they’re pulling my leg & my wallet. But – hey – at least I’m helping to boost the economy! Let’s just all be real from inside. Like you said, “No more hiding.” Beautiful reminder, Penny! Thank you, so much! I think being real is honestly a lot easier. Just my perspective, however! What a great point! I love the picture and was deeply touched by the post. Thank you! Hi Anna, thank you kindly, my friend! Sometimes we wear the mask so well, we believe it is who we really are, and we don’t so much hide behind it, more become it and the real us is relegated to a room in our minds that we don’t even know exists, and it takes someone else to come along and open that door.